A little boy wanted a bicycle for Christmas. 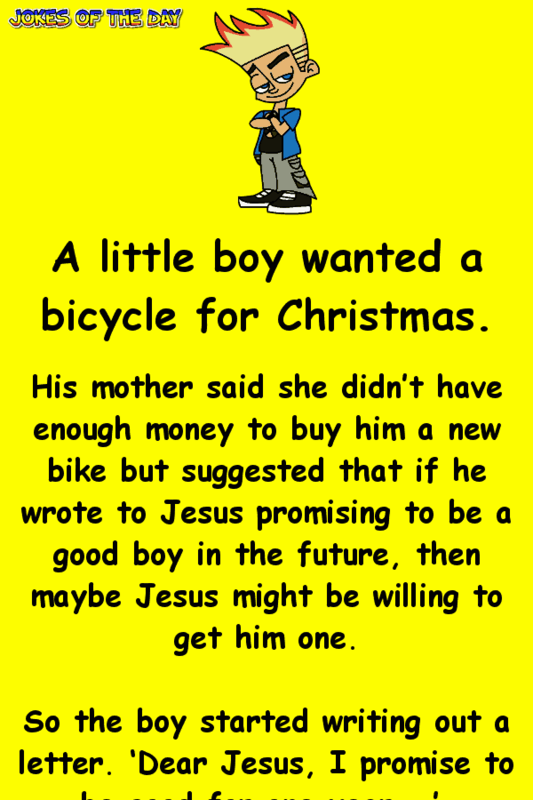 His mother said she didn’t have enough money to buy him a new bike but suggested that if he wrote to Jesus promising to be a good boy in the future, then maybe Jesus might be willing to get him one. Still he wasn’t happy, so he crossed it out and wrote: ‘Dear Jesus, I promise to be good for one week.’ His head in a spin, he tore up the paper and went for a walk. As he passed the local church, he noticed a nativity scene. When nobody was looking, he grabbed the figure of Mary, hid it under his coat and ran home.